If you have a weekend on the Gold Coast planned, then you’ll want to experience every aspect of this incredible region before you take off for home. Fortunately, we have the ultimate guide to packing all the action into 48 little hours, with everything from delicious dining through to late-night parties. Ready? Let’s go! There’s no shortage of world-class dining on the Gold Coast no matter the mealtime. Little Truffle, Citrique and Kiyoma are some of the best Gold Coast restaurants offering fresh and creative dishes. If you’re after a late-night bite to eat, 3 Beans in Broadbeach offers a 24-hour base to sip coffee and enjoy some of the best people-watching that Australia has to offer on the area’s busy streets. 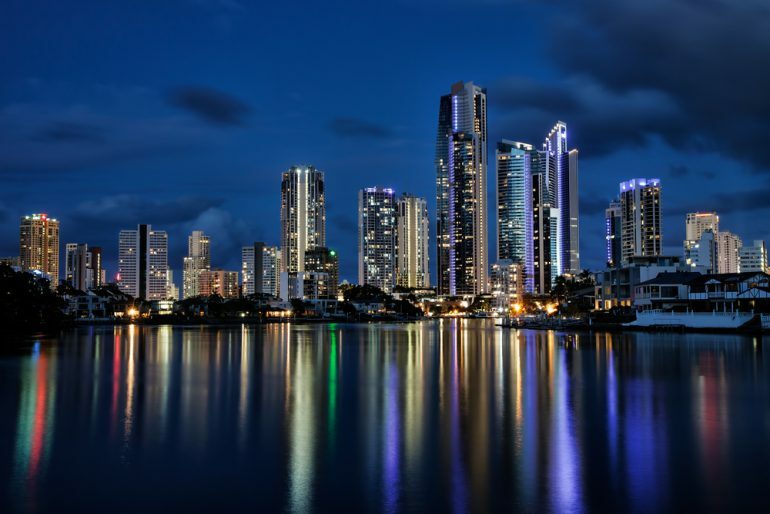 Wondering what to do on the Gold Coast at night? If you love the night-life then you’ll have plenty of options here for your short stay. Head to Broadbeach Tavern for laidback live music and tasty pub grub, or to Love Nightlife or East for live DJ sets and entertainment. In Surfer’s Paradise there’s always something exciting happening, so don’t be afraid to set out on the street and see where the night takes you. If you don’t seek out some wild rides in your 48-hour visit then you won’t have really experienced the Gold Coast. Take your pick from Dreamworld, Sea World, Warner Brothers Movie World or Wet’n’Wild for totally addictive entertainment and adventure. If you’re asking yourself, “What to do on the Gold Coast today?”, the sky is literally the limit. You might book a surfing lesson, hop on a hot air balloon high above the coast, or hire a jetpack or jetboard and have a blast zooming through the water and the air. Just don’t forget your camera for photo evidence that it happened! You’ll be spoilt for choice when it comes to luxury accommodation on the Gold Coast, but our hot tip is to book into our Broadbeach or Southport hotel-apartments for luxurious one, two and three bedroom suites overlooking the vibrant beaches and cityscape. The oversized living spaces make the perfect base to come back to in between filing every minute of your Gold Coast escape. We can’t wait to welcome you.